Mr. Samuel Field, the Circuit Steward of the Central Hall Mission, Bradford, is a born secretary, and in the Band of Hope, Sunday School, Bazaar, and circuit his brain and pen have been kept busy. An expert financier and a scribe of the highest order he has also rendered splendid service to the P.S.A. 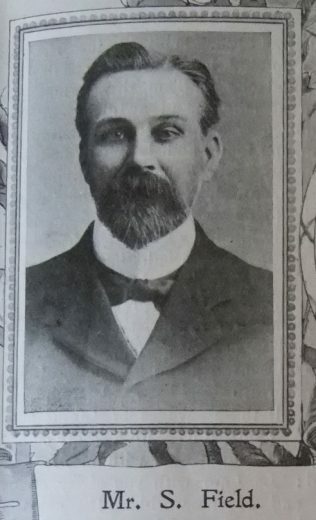 A life-long Primitive Methodist he is also linked by marriage with the founders of our church in the city, Mrs. Field’s grandfather being the sixteenth member and one of the first local preachers of the society whose home for some years was in Reform Street. This street prior to the advent of these men of God was known as Devil Street. Both Mr. and Mrs. Field are justly proud of their Primitive Methodist lineage and have striven hard to advance the cause which their ancestor did so much to found. During his nine years’ Chancellorship Mr. Field has given every satisfaction to his brethren. Samuel was born in 1848 in Bradford, Yorkshire, to parents Joseph and Elizabeth. Joseph was a bootmaker. At the time of the 1891 census, Samuel was a school board officer. He later became school attendance superintendent. Samuel married Emma Hodgson (1848-1934) circa 1872. Census returns identify one child.